Among office furniture, the executive desk is king. They can come in many shapes and sizes, and most have an elegant design with the large surface area, enough to hold all of your computer accessories, printers, phones, and other accessories. You can really spread out your productivity on these large desks. We’ve put together the best of the best so you can make an informed decision about the desk you want! First, let’s see what we need to go. Finish: This refers to the color that the desk is. This can be a variety of colors and stains – most desks are black, white, or natural wood stain colors. There is a wide variety of colors for these desks! Shape: There are three different shapes that the desks on our list come in. L-shaped allows you two workspaces, U-shaped gives you three, and the rectangular desk is a single surface for all of your appliances. Drawers/Shelves: The number of drawers and shelves that are available tell you how much you can store on the desk. This is great for people who need access to a lot of things at a moment’s notice. Keyboard Shelf: The keyboard shelf is a rolling surface that you can put your keyboard on. Usually located under the desk, it allows you to have more room on the top of the desk to work. Size: These are the dimensions of the desk. 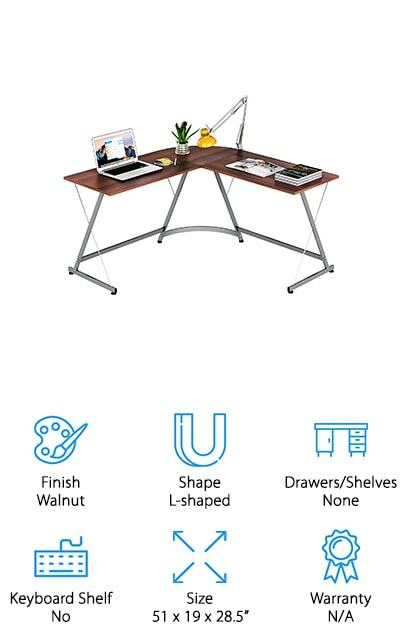 For L-shaped and U-shaped desks, this is irregular, but it usually tells you the entire size of the footprint these desks have. You can choose the best one for your space. Warranty: Protect your purchase with a warranty. Most of these desks come with warranties, which will replace or refund the product if there is a manufacturing error that occurs during normal use. Now that you know everything there is to know about modern executive desks, we can get to the furniture itself! We reviewed a large selection of executive-style desks in order to bring you the ones that are most efficient, use space most wisely, and provide the largest desktop for working purposes. We’ve done our research so you don’t have to worry about it. Our top pick and budget pick are the best at a glance! Our top pick is this high-end desk by Ameriwood Home. It’s a sturdy construction of PVC and laminated wood, which means that it’s going to be lightweight but still heavy enough to accommodate your computer, work accessories, and writing objects. There’s plenty of desk surface for multiple monitors and other things, including storage in the form of three drawers in a mobile filing cabinet. The desk and credenza can be linked together to give you even more work surface, and the bottom drawer in the cabinet is the perfect size for legal documents or hanging folders. It’s finished in white and gray, giving it a modern aesthetic and beautiful, clean appearance. If you need a large, elegant desk set up that will keep your productivity up and give you a beautiful place to get your work done! This premium office desk will look great in any space, especially large rooms and commercial office spaces for multiple people! This L-Shaped executive desk by Altra is perfect to maximize the space in your office! It’s made of laminated particle board with a dark espresso finish that will look beautiful in any modern setting and design. 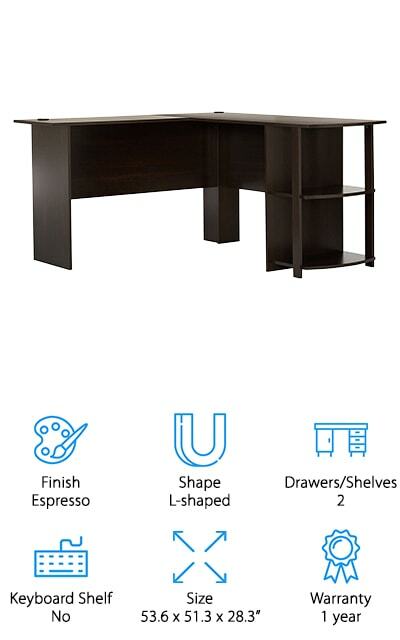 This lightweight desk still has enough space to carry all of the stuff you need on your desk – perfect for people who work primarily from home! You can put it on the corner or up against the wall to open up space in your office and still have plenty of room to work. We love the side storage that’s included with this corner office desk, as well as the grommet holes in the surface so that you can keep all of your cords organized and keep them from tangling up on you. 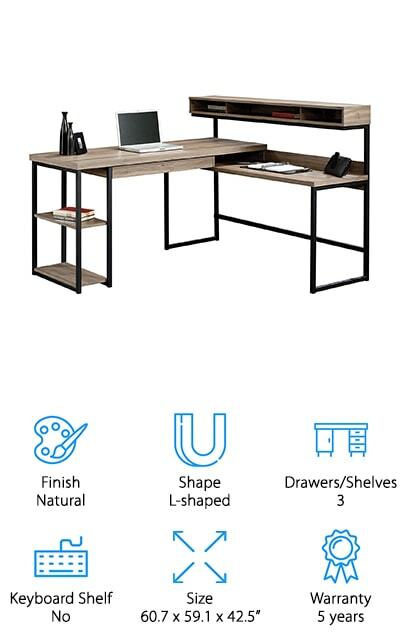 They recommend that you use two adults to help assemble this desk and that you don’t put more than 100 pounds on the surface – that’s still plenty for your computer! 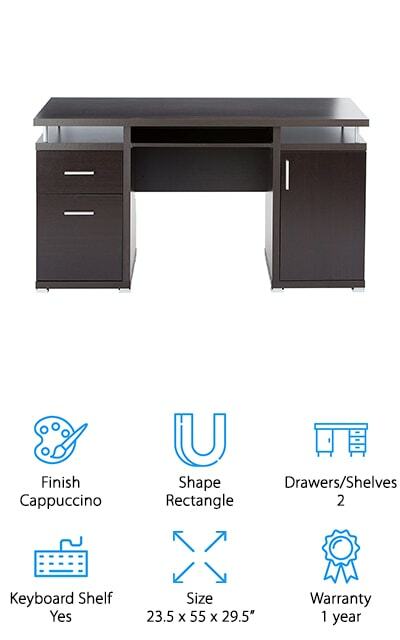 Zuri’s black executive desk set is a beautiful, efficient workspace with a lot to offer for productivity! We love how much space this takes up because you get that much more surface space to help you work. Instead of having a cramped single surface with papers all over, you get the room to spread out and find what you need. There are four lock drawers on this desk, and two of them are large enough for filing purposes. There’s all of this space, but the desk itself is only a rectangle – which is somewhat unique on our list. The floating desktop expands this space significantly. It has a keyboard shelf so you don’t strain your wrists while working, and it’s sufficiently wide enough to hold even the largest gaming keyboards. The finish is a black open grain oak, which is beautiful and modern. This computer desk will blow your mind and help you stay in the zone! The natural wood finish on this L-shaped desk is beautiful! The company calls the light color a ‘salt oak’, which is incredibly accurate for how it looks. There are three drawers beside the keyboard and mouse shelf, and the bottom drawer is the perfect size for hanging files and keeping yourself organized. There is a grommet hole neatly placed on this desk for cord management, which is something we definitely appreciate in an executive computer desk. What we love most about this set is the fact that you can change the configuration of the cabinet and drawers to be on either side of the desk, depending on where you like to sit or what you need to get into when you’re sitting there. 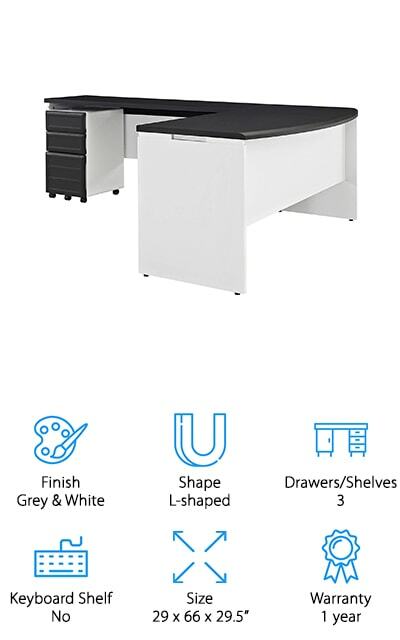 It gives you a large workspace in order to get everything done and working in a positive direction, not to mention the nifty cabinet for storage or for your computer tower. We love it! This premium executive desk is the perfect addition to your space. It’s probably the smallest desk on our list, but that’s perfect if you’re working with smaller offices or spaces where you have a lot of other furniture that you need access to. It’s a 3-piece corner desk with a powder coated finish over a sturdy steel frame. There’s even a foot bar, so you can get comfortable while you’re working. It’s easy to put together and wouldn’t look out of place in a minimalist office. There’s a lot of space on the surface to work while still decreasing the footprint of a larger desk in the same style. We love this open design, where the desktop is the only really solid part of the desk – you can get airflow and comfort through the legs of the desk, and we love that. All hardware is included – all you need is your work stuff and a chair! Coaster makes this beautiful floating desktop computer desk that is simple and will also meet all of your office needs. Though this particular desk is finished in cappuccino, there is also a white executive desk option, which might fit better with lighter color schemes and décor. Keeping the right ambiance in your workspace is important, so why settle for something that isn’t going to match? It’s a great modern, contemporary desk, made of sturdy wood with silver feet to keep it upright and easy to move. There are two drawers, the bottom of which is perfect for a small filing cabinet, and a cabinet that you can use to hold your desktop computer tower. There’s a keyboard drawer to keep your hands and wrists happy after hours of working and typing. All of the features of this desk are amazing. 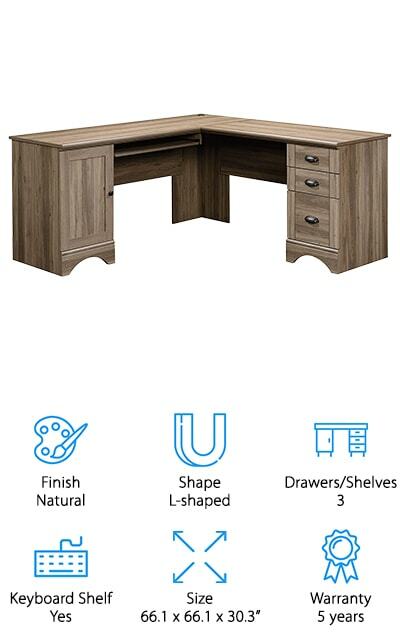 If you need a solid wood executive desk that is simple, this is the one for you! Bush’s Somerset Desk is a beautifully modern executive desk set in an L-shape so you can get to everything you need to. There’s a single cabinet for your desktop computer as well as two drawers on the other side of the desk. The bottom is a filing drawer and the top can hold all the needful things that don’t have a place on your desktop. The hardware on the whole of this desk is modern and sleek, a brushed silver metal that looks amazing. Even the legs on the desk are tapered to lend to the functional look. There’s plenty of room for multiple monitors, printers, and other things on this desktop. You can spread out larger projects with no problem! There’s rear wire access to eliminate clutter from cords and to keep them out of reach of your children and pets. 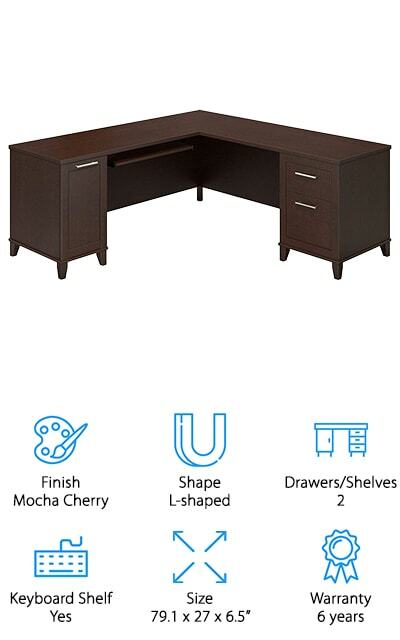 We love the mocha cherry finish on this sophisticated wooden executive desk! 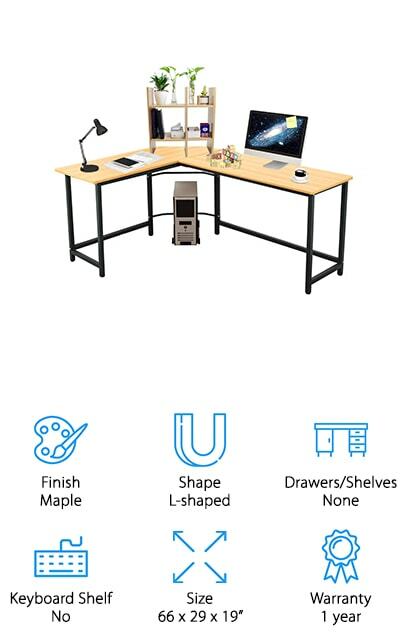 Realspace makes one of the only U-shaped desks on our list! This piece is huge and beautiful, and you can even buy a hutch to go with it to get the full effect and more storage space. The L-desk is detachable from the straight side, so you can configure it how you want it. 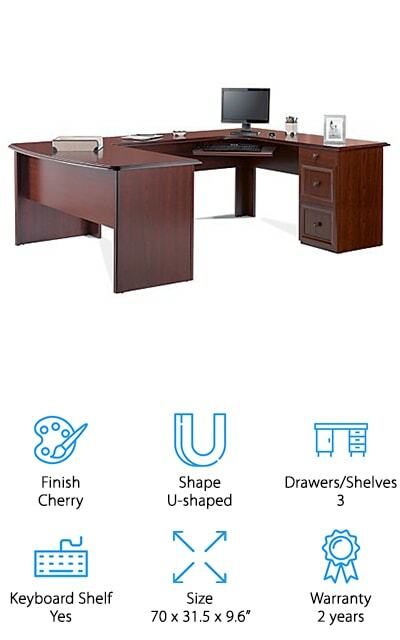 Who doesn’t love an executive desk set that matches? The keyboard shelf is situated in the corner of the L-shaped part of the desk, saving space and giving you the availability to put your computer monitors out of the way. There are three drawers on this desk, one of which locks to save all of your special things in. 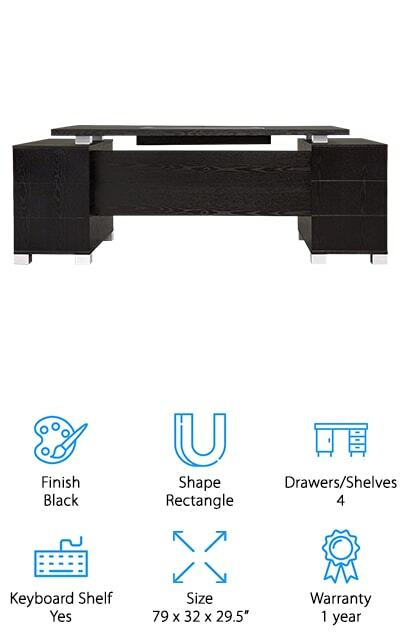 What we love most about this desk beside the shape is the integrated power source. That’s right – it has its own Ethernet, telephone, and electrical plugs. Once it’s hooked up, you’re good to go! The finish is a gorgeous Cherrywood that will really stand out! Saunder is on our list again with another great desk! This one is a minimalist’s dream – it’s all boxes and clean lines, with storage that is understated and perfect for modern offices. The bottom area is open, instead of being boxed in like so many of the desks on our list. There’s a small shelf attached to the shorter side of the desk, as well as a locking drawer right under the computer area. We love that this desk is in stages, instead of being one continuous surface. That’s stylish and useful! You can fit so much in this space and in the floating shelf above! There are two shelves on the other side of the desk as well for all the other things you’ll need. Additionally, there’s a cord managing system which locks them away inside a compartment on the desk that shuts down, blocking them from damage and clutter. This desk really has it all! This contemporary, modern desk is perfect for people who need to get to a lot of things, but don’t need the wide open surface areas of some of the other desks on our list. The open L-shaped design gives you plenty of freedom. It’s also one of the smallest on our list, so if you have a smaller space in a dorm or small office it’s perfect for you. The surface itself is glossy and smooth, so it’s comfortable to use and will make your décor look even better. It comes with a two-tier desktop rack for storage to help keep your area neat, as well as a CPU stand so you can move your desktop around on wheels when you are moving it from one area to another. This desk is full of convenience features with a sleek look that you’ll love to have in your space, and you can get everything you need to be done!